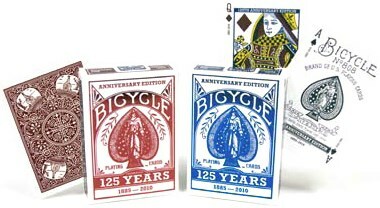 Playing Cards produced by USPCC have been known for their exceptional quality for 125 years. The United States Playing Card Company is commemorating there 125 Year Anniversary with these Special Edition playing cards featuring a distinctive Vintage aesthetic with a signature metallic foil face on the special edition tuck case. Refined in either red or deep blue editions.